I've always liked getting a small cooking item whenever I travel. In South Korea it was a set of metal chopsticks, in the Rioja region of Spain it was a wine opener. When I went to Northern France this past August to visit my father's family, I came home with a beautiful, but simple, fluted brioche mold. 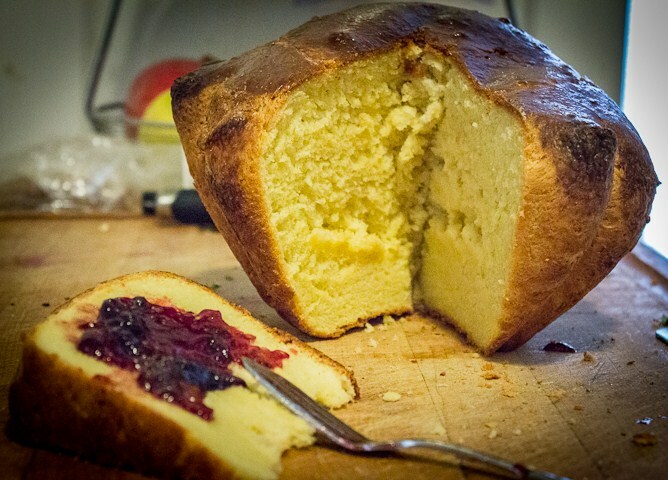 Brioche is like the heavenly combination of cake and bread. Marie Antoinette lost her head in discussing the merits of brioche, saying "Qu'ils mangent de la brioche," or "Let them eat cake." At my French grandmother's house (not technically my grandmother, but close enough), we had toasted brioche every morning with breakfast. She explained normally they would just have regular toast during the week, and brioche on the weekends. But our visit was a special occasion...and her husband was in love with the bakery owner, she teasingly added. "Mais no!" he exclaimed, "I am in love with her brioche!" It was really good, too. So I picked up this bread mold for about $11 US. Brioche gets its richness from the classic French staples of butter and eggs. Every 2 lbs of flour can have a pound of butter and six or more eggs. 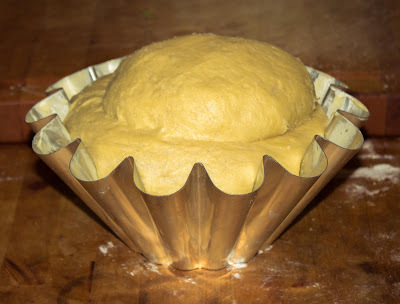 This requires some careful handling, and 3 long, cool rises, so that the butter does not get too warm and separate out from the dough. Also, since the dough is so wet and sticky, you need to knead the bread by stretching it out and slapping the dough down. It's like trying to develop gluten and knead a gummy pancake batter. But by slowly working the butter in, a nugget at a time, you can keep the dough from getting too unmanageable. I thought of it like adding broth to risotto; you add a bit, keep working the pot, and then add more once the dough (or rice) had taken up the addition. So then the dough rises in a cool room, until you smack it down. Then it rises overnight in the refrigerator, where the cold lets the buttery, sticky dough firm up, as well as slows the fermentation down so the yeast doesn't overwork and give the bread a boozy, harshly yeasty flavor. The next morning, you take the dough out, which is now much easier to handle cold. Pack it into a well-buttered mold, and then let it slowly rise for a third and final time. The fluted mold gives the bread lots of crusty, crunchy ridges, but in a crumbly, shortbread type of way. Not exactly "crusty" like a baguette. This is almost "pie crust" crusty. My favorite type of crusty. As the brioche bakes, the fluted ridges allow it to rise up and outward, like an enormous popover. Once it has cooled, you can see the almost fantastically bright yellow center; a testament to the amount of butter and egg yolks in the dough. So while this is still a special occasion bread, I'm thrilled to be able to recreate it at home. But knowing all the time and effort that goes into brioche, I find it funny that "brioche" has become one of those precious buzzwords on menus across the U.S. Today even food trucks will serve you a burger on what they call a "brioche bun." While I'm happy the American food landscape has blossomed so much, a snarky part of me, remembering all the effort involved in kneading that gummy dough, wants to look down my snout at them and ask, "Mais non, is this real brioche?"